The Tancreds were formerly a family of some repute in Yorkshire when a William Tanckard was steward of the forest of Knaresborough to the Earl of Cornwall in the 13th century. In the 16th Century Ralph Tankarde (died 1601) married the daughter of William Lawson of Cramlington in Northumberland. He and his wife were the ancestors of the Tancreds of Arden. Arden Hall, in the parish of Hawnby, the family seat, is a mainly 17th century house but with earliers parts. In the nearby church, in Hawnby, there is a polychrome-painted marble and stone memorial to Ralph Tancred which incorporates the family arms. It is conceivable that the making of this bed commenorated an event in his life. 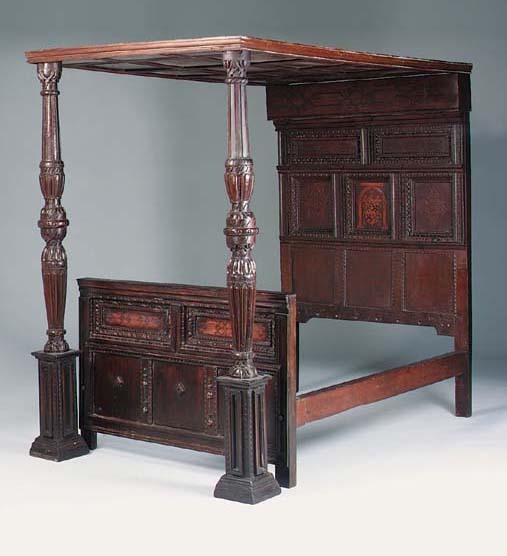 Bulmer's History, Topography and Directory of North Yorkshire, published 1890, page 707, has an entry for Arden Hall, part of which reads this: - "In a small bedroom is a black oak bedstead richly carved and inlaid with the Tancred arms. This room is called Queen Mary's Room and it is said, but we cannot vouch for the truth of it, that that much-persecuted queen slept here."